I could not find the time to update my blog for the past one month. Yesterday when I was going through articles and research findings I came across some important facts which I thought of sharing with you. It looks like that in the year 2010 search engines are going to play a major role than before. Influence of search results is the major part of the purchase decision cycle. Based on research it was found that 68.3% of search was related to the consideration stage and almost 42.6% search came for decision stage. But there are threats for Google as well because of the rise of Bing. Google has already lost its 1% market share and Bing starting to grow . Within just a 3 months it has gained the 0.4% market share which has high travel technology as well. So in future it can be turned out as a major travel search engine. Let’s see what happens. So what are the recent changes in Google? It has recently announced (Oct 7, 2009) the search results now feature an option allowing users to view formatted PDFs from within the browser. Also Google introduced the new feature on Sep 23, 2009, to the Gooel toolbar that allows anyone to leave comments about pages as they surf the web site. The more comments you have for your site the more value is increased. 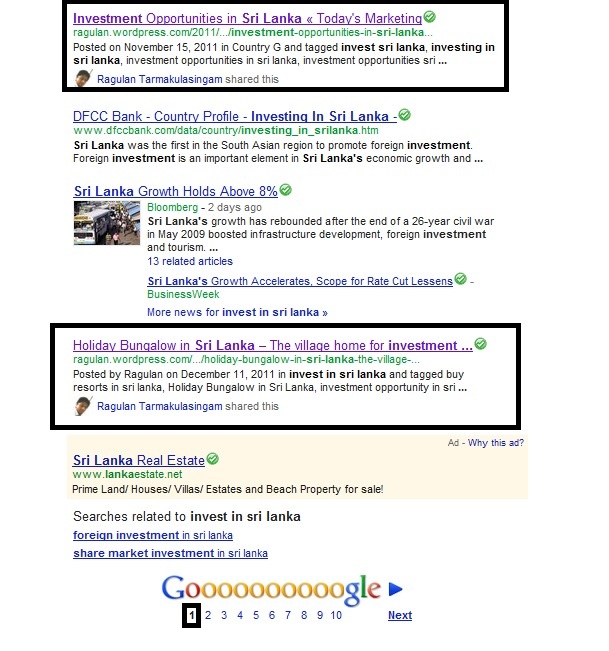 Google’s searchwiki, a major addition to its user interface that allows users to edit search results. When using searchwiki you can re-order, remove or add web pages to search results for any query. You can add any number of comments you want, but there are few criteria Google consider. The quality of the entry, the author and user contributed signals such as voting and flagging. But one thing I have noticed the old SEO mantra remains the same. Meta tags, title header, alt tags and content are the kings anyway. Social media integration like videos , photos , blogging and tweets are going to play a major part. In simple I can see that the role of Social media effort is to directly influence social communities so that the social media pages show up in the search results. Please find below some measuirememnt of ROI you can use. ROI is a function of the goals may not always be monetary, but people have to consider ROO(return on objectives) such as branding, awareness relationship and engagement. Here are some cool tools I found when getting contents for my post. Post Rank – Allows to enter a feed URL and returns statistics about its posts, including which are the most popular based on how many times they are shared on variety of social networking sites. Xinu – Is a handy website where you can type in a URL and receive a load of useful statistics ranging from SEO to social bookmarking and more. Google Trends – People can compare the world largest interest in favorite topics. Also use Google analytics and feedburner, quancast and copmeptecom If you are running a small site you can use Clicky instead of analytics. Although off line marketing trend is stronger now, but it is time for every business circle to think of online marketing much stronger than before. To Come top in the Google search results within an hour. It is always difficult to come top in the google results position in an hour. Just worked out few techniques and finally got the idea how it works. I heard recently Google has changed the way of crawler’s work. I have created a video to test this technique. Named the video with a title which is having 17,000,000 search results in Google and the keyword title was “new marketing trends blog”. Video – http://www.youtube.com/watch?v=yPR02oDXriU see below the screen shot as well. I think it is time for marketers to think about the use of YouTube. After aquired by Google it has become more search engine friendly. In my point of view all can optimize their videos for targeted keywords, and can get the videos on top. I also observed that if we can upload it to more than 10 video sites and optimize, can see the results even better because if you optimize only one video channel, in a few days time it will go down. So continuous optimization will help you to retain the position. Trying to going inline with all the changes in search engine optimization is a always a difficult task. It’s an ever-changing industry with new trends and dimensions. SEO is still going to play a major impact on the online business. Currently I’m reading for me e-marketing award so tend to search for some trends about SEO and came across the followings from various webs. The trends are amazing anyway based on my experience I also got some points to tell. 1 – Google is going to remain the the top of the curve. According to Cnet Google conquered nearly 70% of Internet searches in year 2008. So what does this means? You all have to optimize your site for Google. It is also important to note that Google had made 400 changes in the algorithms as well. 2- Links are important. Get quality links pointing to your site. Do not forget to make your content in an exceptional quality. I think Google always monitor this because recently I have created a blog by doing continuous book marking. Within 2 weeks I got 1 PR. It remained for about 1 month and then again vanished. So make sure you get quality link without spamming. 🙂 Make your site more informative. Because recently based on research there are more “lookers” than “getters”. People search more for information than make a transaction. Even if you’re selling something, you must provide some free information that draws outside resources to your pages or you’re going to get left behind. Quality content = links = credibility = rankings. 4- Based on the recent research I found that video optimization is also going to be a key in SEO. YouTube strategy need to be developed in order to get to the top position or organic ranking. This can be done easily I will post this as my next post. Where within 2 hours you can come to the first Google result page. My argument is if you are running a web site and if you are not getting in the top position then worst. But instead of page if your videos are in top position again you will find it good. 5 – With smartphones like the iPhone and new BlackBerry becoming wildly popular, local search is going to be huge in 2009. If your products appeal to people on the go, or if you have a local downtown shop of any kind, you need to get busy with LBL (local business listing) optimization. The next customer who drives right by your shop may have been looking for you at that very moment, and found nothing. 6- SEO now going to be the in house function. In order to cut cost firms are going to invest more on SEO internally by training and developing competent people in this area. 7. SEO Scams The downside of increased interest in SEO is that many small business owners will continue to spend money making unethical scam artists rich. 8. Personalized Search Results Personalization of search results has been simmering for a couple years now, but has started going mainstream recently. Google is leading the way with things like SearchWiki and Preferred Sites. Plus, things like your location, your recent searches, and which datacenter your search gets sent to can also impact the 10 search results you see at any given moment. It will continue to become more unusual to see the same 10 results when you and a friend in another state do the same search. 9. Local Search and Mobile Search Mobile search has been on the way for years, but it never arrived. Until now. Mobile search used to be as fun as root canal, but the growth of smartphones – fueled by the iPhone – means mobile search is more enjoyable, more productive, and more popular than ever before. If your business appeals to people who might be searching on the go, local SEO should be a high priority for you in 2009.